July 28, 2015 – Harold Wilke stared thoughtfully into his coffee cup and swirled the dark liquid in a gentle arc. It was the 1980s, and we were sitting together at the head table of an ecumenical banquet, unusual for me but not for him. I was asking him for some biographical details so I could introduce him to the group. His grin broadened and his eyebrows danced like small centipedes. I didn’t mention Harold’s sartorial tactics in my introduction, but I laughed. One thing everyone remembers about Harold, who died in March 2003, is that he had a knack of making people around him feel comfortable. He knew most people don’t have a social plan for engaging an armless man, and polite people may feel awkward around a person who uses his left foot to write, eat, and swirl his coffee, all with graceful motions. But by the time I had dined with him for fifteen minutes, his unaffected manner and warm conversation had diverted my attention from his uncommon style of eating. Harold H. Wilke, a United Church of Christ minister, was born without arms on a farm in Washington, Mo, in 1915. In rural America prior to World War I, his disability was considered freakish and his first test in life was to avoid being shunted aside to a dark bedroom or soulless institution. Without arms, he naturally used his feet to grasp food and other items. As he grew to adulthood, he could stretch his left foot to his head to scratch his nose, wash his hair, feed himself, and hold a pen. His foot writing was elegantly legible. All of this he accomplished on his own. There were no social programs in pre-World War II America to assist him. His local elementary school in Missouri thought he would be a distraction to the other children so they told him not to come. According to Fred Pelka, a historian of the disabilities rights movement, Harold was forced to walk miles each day to another school. He faced similar discrimination in college where he was forced to eat apart from his fellow students in the kitchen. In later life, Wilke rarely talked little about being a target of adolescent taunting when he placed a fork between his toes to eat, but it must have been intense. Sadly, the disdain never entirely disappeared. In the mid-1980s, a staff supervisor summarily rejected my recommendation of Harold as a keynote speaker for a Baptist banquet supporting Christian education. “I can’t imagine the boss sitting with someone who eats with his feet,” she said. Wilke was ordained in 1939 by the Evangelical and Reformed Church, a conservative branch of what later became the United Church of Christ. He attended Eden Theological Seminary in St. Louis and Union Theological Seminary in New York, where he was a student of Paul Tillich and Reinhold Niebuhr. I remember watching Harold preach as he stood erect behind a pulpit dressed in a black robe and clerical collar. His homiletical style was understated but engaging and his eyes scanned the room to connect with each member of the congregation. He would stress certain points by tossing his head in the manner of FDR, the paraplegic president whose hands were locked on the podium with white-knuckled ferocity to keep from falling. 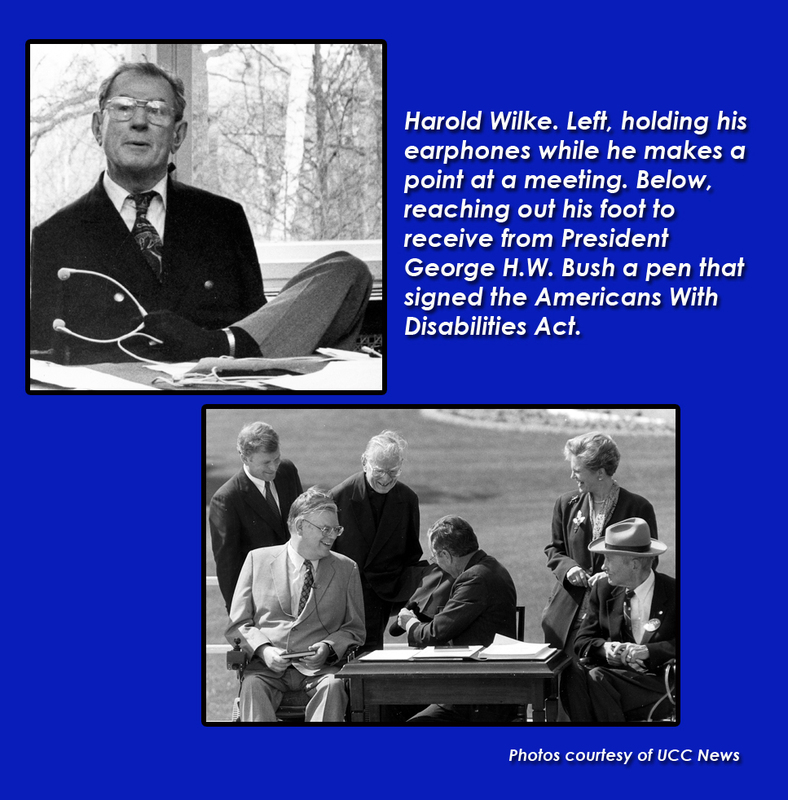 Harold was also instrumental in the passage of the Americans With Disabilities Act (ADA), signed by President George H.W. Bush 25 years ago this month. The act was born in the gone-but-not-forgotten era of political bi-partisanship. Poppy Bush was experimenting with “kindler, gentler conservatism,” and not even Strom Thurmond was cold-hearted enough to ignore persons who reminded him of wheel-chair bound baseball hero Roy Campanella or blind and deaf Helen Keller, both adored by voters. Today, two realities stand out about the ADA. One, nearly all Americans benefit from the act, or will when the ravages of age and disease catch up with them. And two, it could not pass in the partisan morass that paralyzes Congress today – an analysis affirmed by former Senator Bob Dole, a disabled veteran who was a sponsor of the bill. It’s that latter point that makes me wish great leaders like Harold Wilke still walked among us. The Americans With Disabilities Act requires employers to provide “reasonable accommodations” to employees with disabilities, and obliged businesses to make all public places accessible to everyone. It is the ADA that requires mechanical lifts on buses, curbside ramps on street corners, ramps bypassing steep steps, and other accommodations for wheel chairs. Telephones, televisions, computers, and other electronic media are now designed to assist persons unable to see or hear their messages. Virtually none of these things existed a quarter century ago, and there was widespread criticism that businesses would be bankrupted by the ADA’s requirements. Today, all of these improvements are taken for granted. A list of conditions considered disabilities embraces vast numbers of Americans: deafness, blindness, an intellectual disability (formerly termed mental retardation), partially or completely missing limbs or mobility impairments requiring the use of a wheelchair, autism, cancer, cerebral palsy, diabetes, epilepsy, Human Immunodeficiency Virus (HIV) infection, multiple sclerosis, muscular dystrophy, major depressive disorder, bipolar disorder, post-traumatic stress disorder, obsessive compulsive disorder, and schizophrenia. My family – and certainly yours – has members in more than one category of disability. My mother was legally blind until she received cornea transplants in the 1960s. My father, a World War II veteran of the bloody Buna campaign in Papua New Guinea, showed signs of post-traumatic stress disorder. Cousin Donny had Down Syndrome. Cousin Grace lived her life in a wheel chair. Closest to home, daughter Katie, 28, is autistic. I can’t imagine what life would have been like for Katie and our family were it not for the Americans With Disabilities Act and other government services that were made possible by the ADA. In the same way, I can’t imagine what our life would have been like without the advocacy of Harold Wilke and others who helped the public understand that persons with disabilities have unalienable rights that the government is bound to recognize, and who helped push the ADA through Congress. Harold, dressed in a crisp dark suit, stood directly behind President George H. W. Bush when he signed the Americans With Disabilities Act on July 26, 1990. When the president turned to give Harold a souvenir pen, Harold slipped his left foot out of his loafer and grasped the pen with his toes. The president beamed and the crowd applauded. Twenty-five years later, we continue to applaud the act and all it has met to millions of Americans. And we continue to thank God for Harold Wilke, whose birth defect first created the illusion God had played a terrible joke on him. But God had actually given him gifts beyond measure, and millions today still benefit from his life among us. For more about Harold Wilke, read his memoir, Angels on my Shoulders and Muses at My Side (Abingdon Press, 1999).